Our kitchen serves food 11am-10pm 7 days a week, Dine in or Carry out. House smoked pork belly bites marinated in creole seasoning. 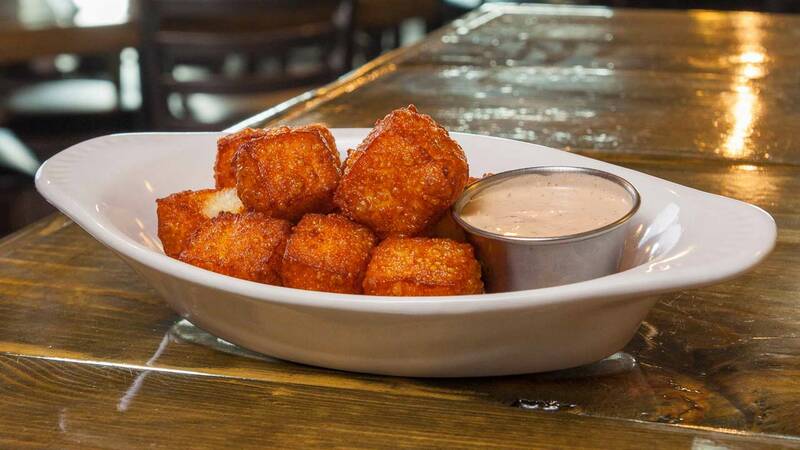 Fresh fried queso blanco served with chipotle ranch dressing. Buttermilk soaked onion rings with an Alabama white BBQ dipping sauce. House made corned beef, Swiss cheese and sauerkraut in a crispy wonton wrapper with 1000 island dressing dipping sauce. Creamy beer cheese dip with roasted pork belly bits served with warm soft pretzels. Tempura battered crispy fried dill pickle slices with a ranch dipping sauce. Parmesan risotto, stuffed with fresh mozzarella croquette, house marinara sauce, garlic aioli. Nacho cheese, fresh pico de gallo, sour cream, choice of ground beef, pulled pork or pulled chicken. 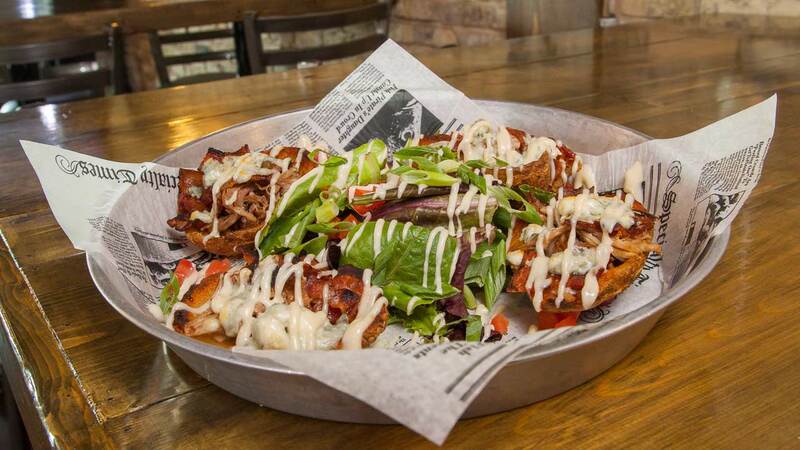 Crispy potato skins stuffed with house made duck confit, caramelized onions, bacon and bleu cheese, roasted garlic aioli. Roasted turkey, smoked ham, bacon, cheddar cheese, hard boiled eggs, diced tomatoes and cucumbers. 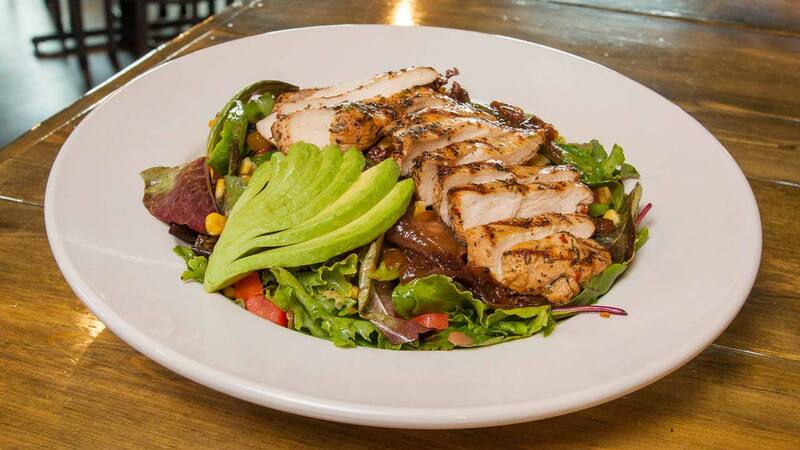 Grilled jerk chicken, mandarin oranges, fresh avocado, roasted corn, Roma tomatoes and grilled red onion with citrus vinaigrette. Grilled chicken breast, apples, crisp pork belly, bleu cheese, craisins and candied walnuts with honey poppy seed dressing. Romaine lettuce, Roma tomatoes, shaved parmesan cheese and homemade croutons with Caesar dressing. Field greens, cucumbers, tomatoes, cheddar cheese and croutons with choice of dressing. 10oz meatloaf topped with smoked bacon, with garlic mashed potatoes, sautéed green beans, red wine demi-glace. Sautéed shrimp and a seafood demi-glace over creamy cheesy southern style grits. 8oz grilled salmon filet topped with a lemon-dill cream sauce, served with sweet basil and corn basmati rice and sautéed seasonal vegetables. Baked cod topped with pineapple salsa, cabbage and jalapeno cilantro aioli in flour tortillas. Served with fresh Pico and chips. Fried or Baked in a lemon, white wine butter sauce. 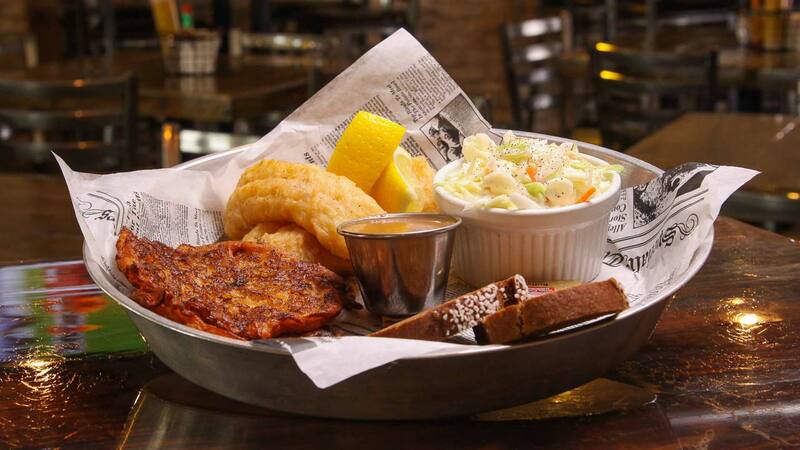 Two pieces of fried cod, two pieces of perch, and two pieces of blue gill. House made cheesecake infused with Bailey’s Irish cream. Topped with a whiskey caramel sauce and whipped cream. Triple layer carrot cake with craisins and walnuts covered in sweet cream cheese frosting. A huge slice of our house made triple layer chocolate cake. 6 or 12 wings with your choice of House made sauces. Atomic Hot (Ghost Pepper), Spicy Garlic, Apricot Habanero, Traditional Buffalo, Honey Chipotle, Jamaican Jerk Dry Rub, Louisiana Dry Rub, St. Louis Bourbon BBQ, Maple Bourbon BBQ. Celery sticks and a choice of ranch or bleu cheese dressing. 6 for $7 or 12 for $12. Red onion marmalade, bleu cheese, bacon and haystack onions on a toasted brioche bun. Cajun seasoned burger patty, fried cheese curd slice, lettuce, tomato and chipotle ranch dressing on a toasted brioche bun. 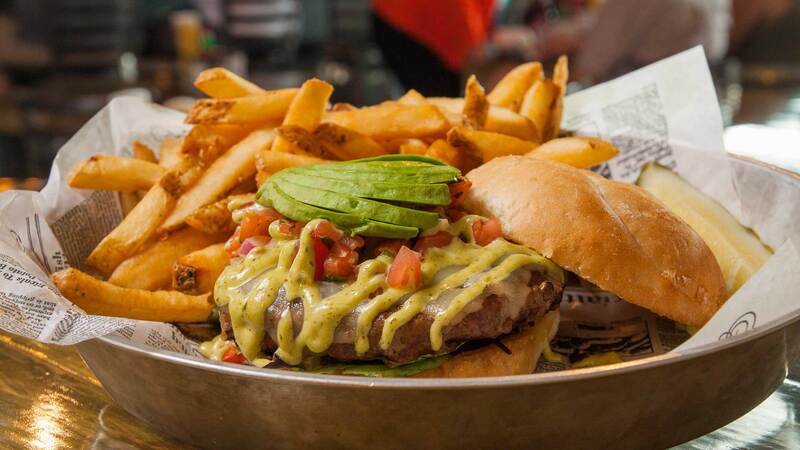 Pepper jack cheese, house made Pico de Gallo, avocado and roasted jalapeno cilantro mayo on a toasted brioche bun. Caramelized onion, sautéed mushrooms and Swiss cheese with a red wine demi sauce on a toasted brioche bun. House made black bean burger, roasted garlic & thyme tomatoes, caramelized onions, mushrooms and smoked gouda cheese with roasted garlic aioli on a toasted brioche bun. House made potato pancake, bacon, aged cheddar cheese and an egg to order on a toasted brioche bun. Griddled Black Angus shaved sirloin, onions, sweet bell peppers, mushrooms and a traditional Philly cheese sauce, on a toasted hoagie bun, can substitute chicken. 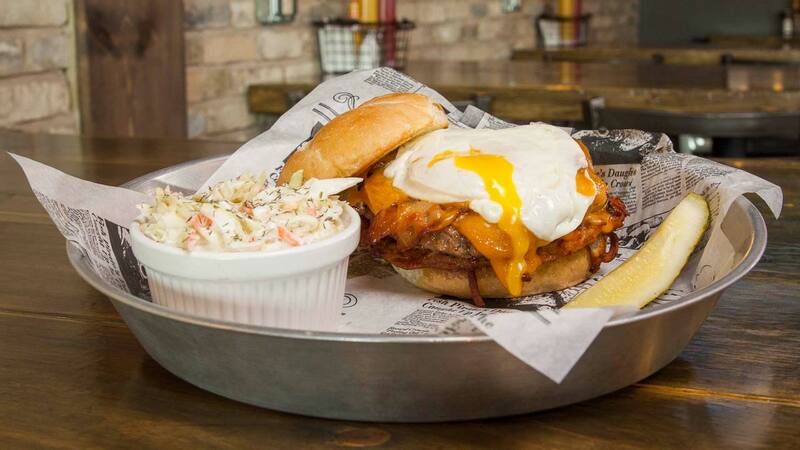 A half-pound of house smoked pulled pork, aged Wisconsin cheddar and house made coleslaw on a toasted brioche bun. Traditional Carolina, Memphis style, or St. Louis BBQ sauce on the side. House smoked pulled pork, Applewood smoked crispy bacon, Dijon mustard, diced pickles and Swiss cheese on a toasted hoagie bun. Maryland lump crab cake, lettuce, tomato, apple wood smoked bacon and basil aioli on toasted sourdough bread. A half pound of house made corned beef, sauerkraut, Swiss cheese and Thousand Island dressing on toasted rye bread. Grilled chicken breast, sautéed spinach, mushrooms, caramelized onions, fresh mozzarella and smoked tomato aioli on a toasted hoagie bun. A half pound of slow roasted beef tossed in gravy topped with melted gruyere cheese, haystack onions and a creamy horseradish sauce on a toasted hoagie bun. Bacon, lettuce, smoked turkey breast, tomato, avocado and basil aioli in a spinach wrap. Buttermilk fried chicken breast, bacon, pepper jack cheese, lettuce, tomato, avocado and ranch dressing on a toasted brioche bun. Old Bay seasoned sautéed shrimp, lettuce, tomato, cheddar cheese and Santa Fe dressing in a chipotle wrap. House smoked brisket, cheddar cheese, haystack onions, St. Louis bourbon bbq sauce. Caramelized onion, raw onion, haystack onion, spinach, jalapenos, sauerkraut, mushrooms, Pico de Gallo, pineapple salsa. 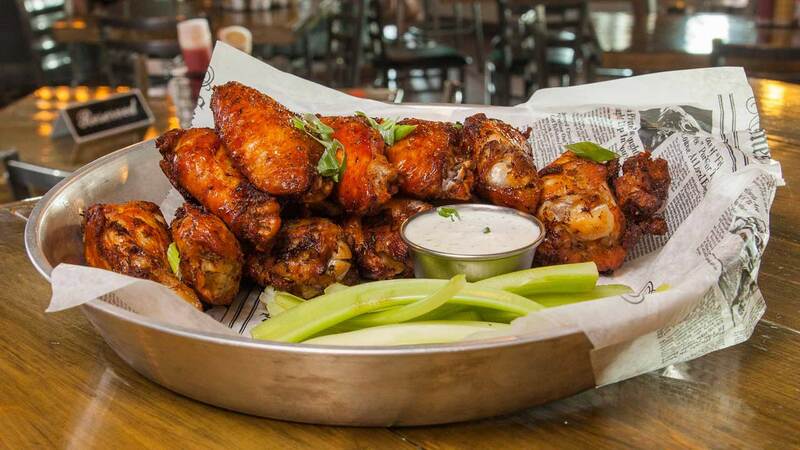 Garlic aioli, red onion marmalade, tomato aioli, jalapeno cilantro aioli, basil aioli, marinara sauce, Santa Fe, chipotle ranch, horseradish cream sauce, honey mustard, Carolina BBQ, Memphis BBQ or any wing sauce. All sandwiches come with choice of House made chips or French fries. Macaroni noodles tossed in a creamy cheese sauce. Grilled ¼ pound burger with choice of cheese, and fries or chips. Toasted white bread with choice of cheese, and fries or chips. House made chicken tenders, fries or chips and choice of ranch or BBQ sauce. Consuming raw or undercooked meat may increase your risk for foodborne illness. Opened in 2015, The Hale House is a bar and restaurant located in Hales Corners, WI. 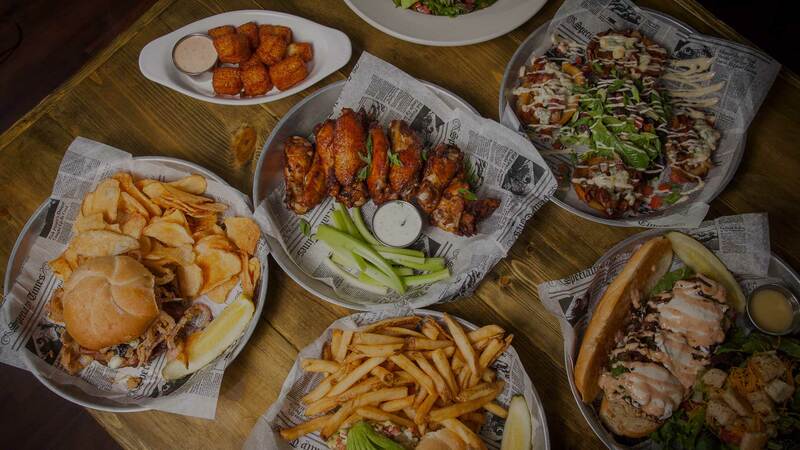 We serve a wide range of grilled favorites with awesome drinks & Wisconsin’s finest craft beers, so come on and join the fun!